Doors to Endeavor Middle School (22505 26 Mile Rd, Ray, MI 48096) will be open at 8am. Although doors will be unlocked prior to 8am, we are not allowed to have attendees in the building until 8am. Thanks for your assistance on this. 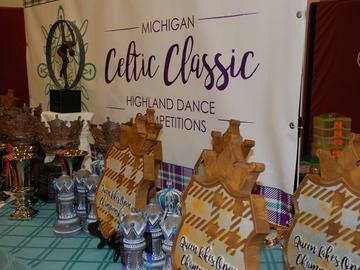 Registration for Demonstration, Primary, Beginner, Novice, Intermediate and Pre-Championship competitions will take place from 8:00am-8:45am with dancing beginning at 9am. The competition will start with the Beginner and Novice Flora, followed by Primary and Demonstration Pas de Basques, then Intermediate and Pre-Championship Fling. Registration for the Choreography competition will take place from 10:00am-10:30am with the choreography competition starting at the conclusion of the morning dancing (approximately 11:00am). Choreography max of 1:30. Please email music to QOSDA@hotmail.com by May 10, 2019. Choreography and Morning awards will take place together, starting with choreography. Championship registration will take place from 11:30am-12:30pm with the Championship competition starting at the conclusion of the morning awards (approximately 12:30pm). Championship age groups: 7 & Under 12, 12 & Under 14, 14 & Under 16, 16 & Under 18, 18 & Over. May be adjusted based on entries received. Competition will be conducted in accordance with the rules of S.O.B.H.D. Age groups determined by entries, including Championship. The decision of the judge is final. Dance numbers will be provided at registration. Contact QOSDA@hotmail.com with questions or visit www.QOSDA.com. No concessions will be provided on-site, but we will have our annual raffle table & on-site vendors. Admission will be $5/person 12 & Under and limited programs will be available on-site for purchase for $5 each (USD only). Children under 12 enter free. $5 USIR donation included in each entry. Save $10 on each registration with Super Early Bird pricing by registering prior to April 19, 2019. Save $5/event on each registration with Early Bird pricing by registering prior to April 26, 2019! (discount accounted for in online pricing!). Entries close May 3, 2019. Spacious suites provide a "home away from home" atmosphere, with fully equipped kitchens containing all the comforts of home. Complimentary breakfast & high speed internet. Studio Suites available with a Queen bed and sleeper sofa for distributed rate of $109/night. Two bedroom Suites available with a Queen bed in two separate bedrooms, a sleeper sofa in adjoining sitting area for only $139/night. Discount available using code "Queen of Scots Dance Academy" until Wednesday, April 17th. Must call with code to make reservation under discounted rates.